I felt lazy. Everything about this recipe is lazy. And, I feel okay about that. I think I deserve to write about something that neither takes a lot of time, nor looks particularly glamourous. I mean, look at the rest of my posts - faaaaancyyyy! Heh. Whatever. 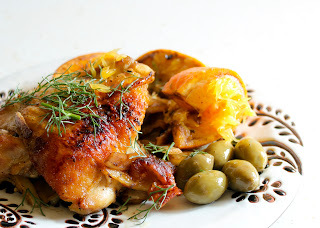 I wanted to incorporate fennel, oranges, green olives, and balsamic vinegar into one recipe. 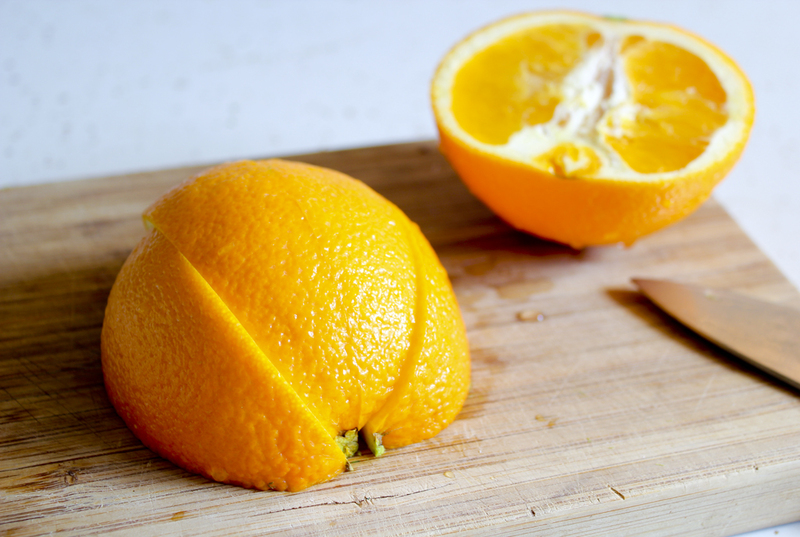 And since I've done a fennel salad with oranges, I couldn't do basically the same thing again. I considered braising fennel in orange juice, but I didn't feel like squeezing oranges (and no I won't use carton orange juice unless it's a negligible part of the recipe). I couldn't be bothered having some components cooked and others not - like sautéing the fennel and then topping it with membrane-less orange segments. I guess the only thing left to do was make a one pan meal. Balsamic vinegar reductions are real high up there on my list of favorite things. Roasted winter squash with it drizzled on top is awesome. I tried to think for like 2 minutes for a better word than drizzled. It's so G. It's like a Special K diet bar in Chocolate Drizzle flavor. Steak is pretty perfect with salt and pepper, and pretty more perfect with balsamic reduction on top. But, you know, a glaze will do the trick too. You don't have quite the control, but it's the lazy man's way to make a reduction - or you can call it a glaze. That sounds way fancier. 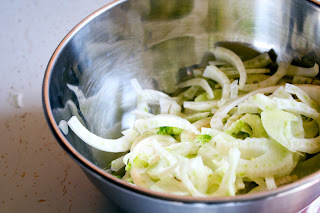 Just dump some vinegar in the pan along with whatever fish, meat, veggie, stir it around for some minutes and you're done. No extra saucepan necessary. It's Restaurant Week here in Denver. The impossibly priced, but still dangerously expensive, two week long "week" of some wonderful restaurants offering too many courses for the price of like one and half courses and making me poor and fat. Unfortunately, I don't like driving downtown. And the public transportation is iffy here. And it's not the most pleasant walking-a-couple-miles-to-downtown weather. So all I want to do is stick around our wonderful little neighborhood, in which I've been to every single restaurant worth going to. First world problem, I suppose. I like the First World. So I'll just (make Joe) spend too much money on going out to restaurants that we've been to before, getting wine, an appetizer that I don't need to eat, an entrée, and a dessert that I definitely don't need. Oh wait, and some places have even more courses than that. And for those restaurants downtown that I still haven't tried, I'll just wait to go to them when its summer and they offer a groupon. I'm a business's worst kind of customer. Okay anyway, so what this recipe is, is pan-fried chicken thighs, oven-finished and set aside. 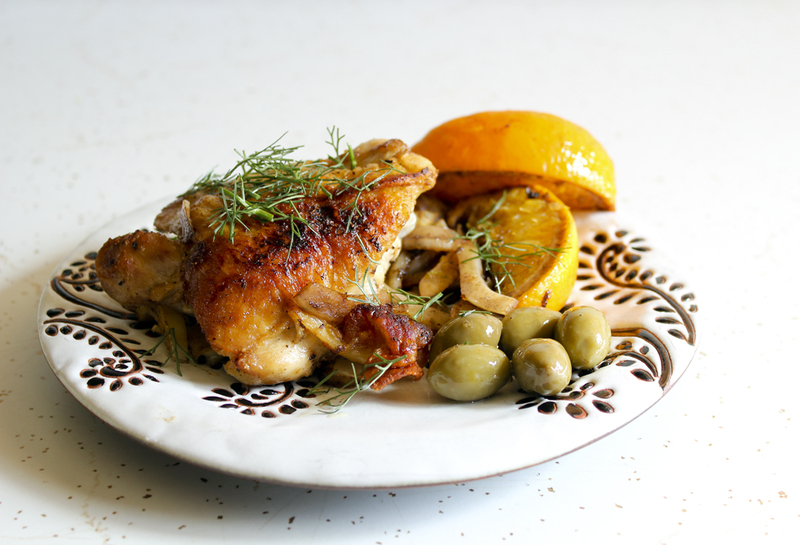 Then, a simple sauté of thinly sliced fennel and unpeeled orange slices with some balsamic vinegar added to the chicken juices to create a sweet, rich reduced pan sauce. Then you plop it all on the same plate, add in some green olives, squeeze those oranges slices over everything and that's my lazy blog post recipe. Generally, my simple weeknight meals aren't quite so cohesive. They're either just really simple meat and vegetables with like salt and pepper for spices. It's nice to have simple meals that kind of veer toward moderately fancy, but that take none of the time of a moderately fancy meal. 1. Preheat oven to 450 degrees. Coat chicken with salt and pepper. 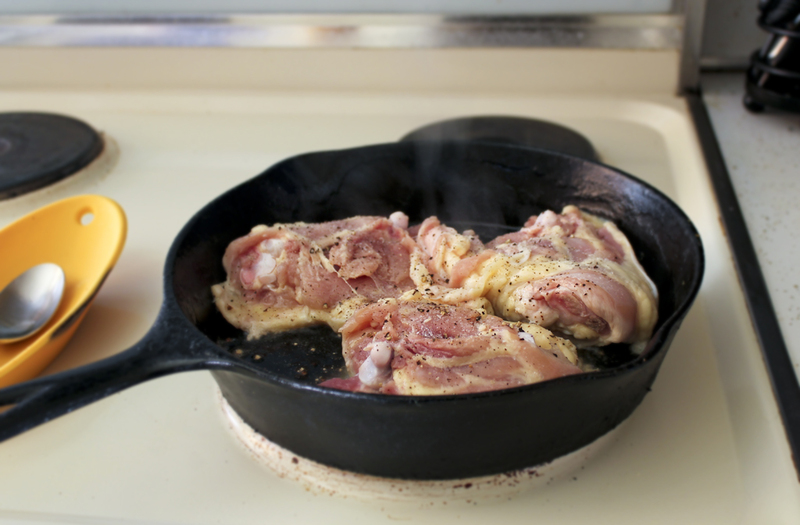 Heat your fat in a cast iron or oven safe skillet over medium high heat. Place the chicken in skin side down. Cook for about 7 minutes, or until the skin is golden and crispy. Flip chicken over and put finish in the oven for about 10 - 15 minutes, depending on the size of the thighs. 2. 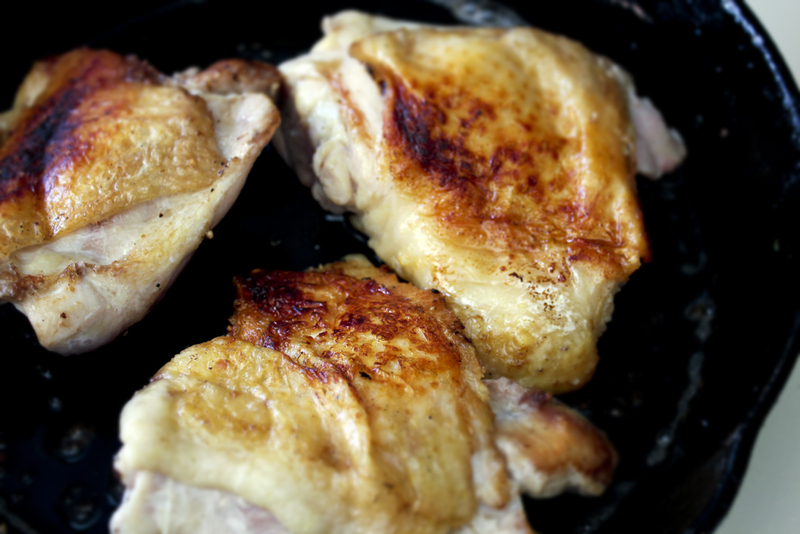 Transfer chicken to a plate, pour off (and save, duh) all but about 2 tablespoons of the fat. Place the pan on a burner over medium heat. 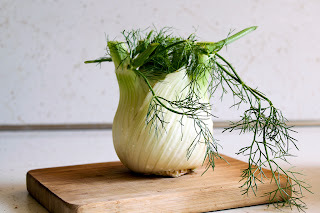 Add in the remaining ingredients and cook for about 7 minutes, until the fennel is just soft and the balsamic vinegar is thick and has nicely coated everything. Season to taste with additional salt and pepper, though if you gave the chicken a nice coating, you probably won't need to. Serve the chicken on top of the fennel, squeezing the orange slices to release more of the juice. Serve some green olives alongside and top it all with the reserved fennel fronds.